Aclarity Systems utilizes a wireless security system to monitor our client premises. We run a remote video monitoring center where are our professional security staff are able to keep eyes on your property. Aclarity Systems can use wireless security camera systems that clients already own, however we have minimum specifications that we require. If the client cameras are not up to standard we will recommend cameras and can also supply them. It is important the cameras offer high definition video and are able to provide a wide viewing angle. We have had great success with our wireless security camera installations and have caught thieves in the act and deterred criminals. You can see some results of our monitored security camera installation as we caught thieves on client premises. Our wireless security system will transmit a video and audio signals through the internet essentially allowing us to operate a video surveillance network for our clients. The video feed is transmitted wirelessly to our monitoring center where we can detect suspicious activity on client property. The wireless camera system is advantageous because it is easy to install and transmit the audio and video signals wirelessly and therefore it is not expensive and there is not need for ugly video extension cables to be installed. Apart from this the cost of each camera is low and the installation is relatively inexpensive. We are able to use multiple receivers per camera to create an effective wireless surveillance network. We are also able to connect the different receivers to recording devices. We record video of perpetrators on client premises using security digital video recorders. 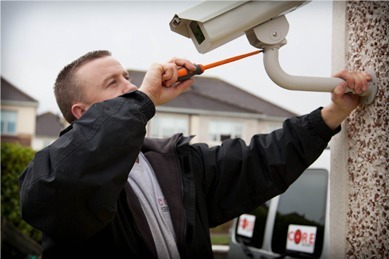 Having this wireless security camera system means that there is less need for manpower on the premises, this allows us to provide our clients with highly effective security solutions at much lower costs due to less onsite security guards.